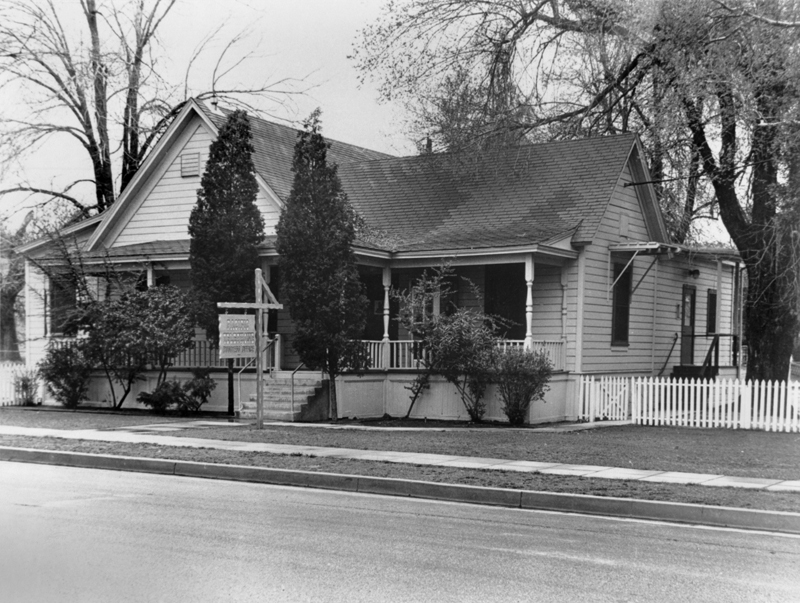 The Pardee House in the 1950s or early 1960s (no later than 1963) when it was the Pacific Telephone business office at the "triangle" of Newhall, Walnut and Market streets (site of the later Veterans Historical Plaza). Landmark — Newhall's old wood frame business office is a nostalgic, if not historic, landmark. It's affectionately known locally as "the country club." A former lodge hall and residence, the building was purchased by Pacific Telephone in 1942 [sic*] for use as the Newhall central office. In 1961 it became the town's telephone business office and has served as such since. * While we don't know the exact purchase date, the new telephone exchange opened in December 1946. Up to that time, the phone company office was on Spruce Street. The Pardee House was built c. 1890 as a Good Templar's Lodge with help from Henry Clay Needham, Newhall's one and only presidential candidate (on the Prohibition ticket). Originally located on Pine Street, in 1893 the building was moved to 629 E. Walnut Street — the "triangle" of Newhall Avenue, Market and Walnut streets by Ed Pardee, who enlarged it and used it as his home. Pardee — whose name would be forever after connected to the house — was a police constable in Newhall and some-time oil driller in Mentryville. Pardee added a small building in the back yard which was often used as a retreat by famed Western star Tom Mix, and some of the earliest John Ford-Harry Carey pictures were shot in and around the home. In 1946 Ed Pardee's daughter, Pearl Russell, sold the house to the Pacific Telephone Co. (later Pacific Bell), which used it as a telephone exchange until the Santa Clarita Valley's telephonic needs outgrew it. In 1970 Pacific Bell leased the house to the Newhall-Saugus Boys Club (later the SCV Boys and Girls Club), which used it as a teen center until 1977 when it was leased to the Newhall-Saugus-Valencia Chamber of Commerce (later SCV Chamber of Commerce). The house served as the chamber headquarters until it, too, moved on in 1987, and the house reverted to Pacific Bell. In 1992 Pacific Bell donated the historic home to the Santa Clarita Valley Historical Society, which moved it to Heritage Junction Historic Park in the wee hours of Aug. 4. Today the Pardee House is located at the entryway to Heritage Junction where it is being transformed into a museum and visitors center, to welcome guests and showcase artifacts that tell the history of the Santa Clarita Valley. AP1521: 19200 dpi jpeg from copy print.